It has me thinking about what I want to be when I grow up. If I live to be 99 years old, I’ve already lived one third of my life. If you’re measuring out ingredients that’s a big pinch gone to the pie. At the same time, there’s quite a bit left that’s needed to make this thing really great. So what’s this next 1/3 going to be about for me? Not sure entirely, but I am sure of a few things. 1. Stop trying to be a man. Everyone knows that trying to be a man is a huge waste of a woman. 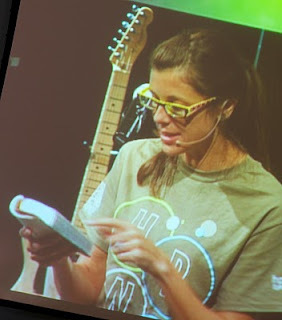 The next time I preach, I’m ditching the “everyone wears converse” look and wearing heels. 2. Buy a good pair of heels. 3. Be unapologetic about the fact that I don’t have all of the answers, and also about the fact that I’ve got a few to share. 4. Enjoy working out. I don’t want to do anything athletic unless it gives me life. I’m jumping off this Zumba train and getting back on the court. Maybe at 34, I’ll enter a sand volleyball tournament with my brother somewhere, or train for the Olympics. Either would work for me. 5. Spend more time praying and connecting with the Holy Spirit of God than I do connecting with the spirit of facebook. I want to know the Word of God. I want it to pour out of me more than the latest Gungor lyrics. 6. Write something that matters. 7. Care enough to know what matters. 8. Give away things. Start with ministry resources. I’ve got tons to share. Email me if you need something. 9. Make happy memories with my children. Plan their birthday parties, make things at home, do things spontaneously, bake up the kitchen, throw spaghetti, dance, and play. 10. Make more happy time with my husband. This could include a variety of things but mainly I want the one you are thinking of. It’s fun. It’s important. God ordained it. Not ignoring it. I’m confident in the person God created me to be. I’m grateful that I get to be a part of so many things that I love. I can’t imagine my life without youth ministry, mission trips, baptisms, writing, training, meeting, talking…I also can’t imagine my life without fun, adventure, my family, my husband, our call to serve and care for others. I can’t imagine my life without reading, without being inspired by babies and nature, and really good stories. I hope we spend more time watching the sunset this year and praying for the people who the sun is rising for as we say goodbye to it for a day. I hope that 33 is a year of giving–sharing–discovering–and living together in a way that gives people joy and peace. It’ll be great to be 33.
this is fabulous! i wanna make more happy time with my husband too. 🙂 happy birthday, dear friend.